academic-bible.com is the leading website for academic Bible study. It provides free access to the original Bible texts in Greek and Hebrew, published by the German Bible Society, in addition to English and German Bible translations. Everyone who studies the Bible knows how important it is to use a carefully and accurately edited Bible text. The orignal language editions published by the German Bible Society have set the world-wide standard for critical editions of the Bible. The German Bible Society distributes more than half a million Bibles annually, including numerous scholarly editions and additional resources for biblical study. It is a member of the United Bible Societies and provides them with the necessary editions for their global Bible translation projects. 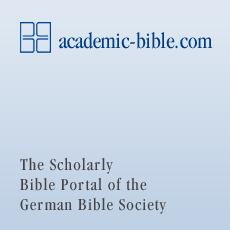 An Introduction to the Scholarly Editions of the German Bible Society.